If you’re searching for a used car in Naperville, rely on the wide inventory available at Gerald Nissan of Naperville. We have a variety of Certified Pre-Owned and used Nissan options, from the Nissan Sentra to the Rogue, but we also have a diverse selection of other makes and models. Contact us to learn more about our current inventory or set up a test drive. Gerald Nissan North Aurora is excited to offer this 2018 Subaru Outback. The Outback Premium doesn't disappoint, and comes with all the quality and understated opulence buyers have come to expect from the respected Subaru marque. A truly versatile SUV, this vehicle will please even the most discerning of buyers. Outstanding fuel economy and sleek styling are two great reasons to consider this Subaru Outback. This Subaru Outback Premium comes equipped with all wheel drive, which means no limitations as to how or where you can drive. Different terrains and varying weather conditions will have little effect as to how this vehicle performs. A truly breathtaking example of pure vehicle design achievement...this is the vehicle of your dreams! This Nissan won't be on the lot long! A great vehicle and a great value! Nissan prioritized practicality, efficiency, and style by including: a rear window wiper, air conditioning, and a blind spot monitoring system. Smooth gearshifts are achieved thanks to the 2 liter 4 cylinder engine, and all wheel drive keeps this model firmly attached to the road surface. Our knowledgeable sales staff is available to answer any questions that you might have. They'll work with you to find the right vehicle at a price you can afford. We are here to help you. While shopping for a used vehicle might seem overwhelming, our Nissan dealership near Batavia, IL , is here to make browsing, test-driving and buying a pre-owned car, truck, van or SUV a simple process. Our impressive used Nissan inventory contains models for every driver, whether you’re looking for a compact sedan or a durable pickup. Test-drive the Nissan Pathfinder if you want to conquer the road from behind the wheel of a spacious SUV, or take the Nissan Maxima for a spin if you’re interested in an award-winning Nissan sedan. 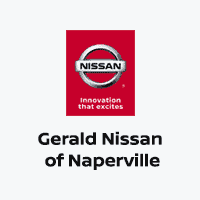 Visit Gerald Nissan of Naperville to find the like-new Nissan of your dreams. Once you’re ready to drive home in your next pre-owned vehicle, make your way from Bollingbrook to our dealership for a tour and test drive. Apply for financing in advance to streamline the process.